The Helper, the Holy Spirit. This age is peculiarly the dispensation of the Holy Spirit, in which Jesus cheers us not by His personal presence, as He will do soon enough, but by the indwelling and constant abiding of the Holy Spirit, who is forever the Comforter of the church. It is the Spirit’s role to console the hearts of God’s people. He convinces of sin; He illumines and instructs; but the main part of His work still lies in gladdening the hearts of the renewed, confirming the weak, and lifting up all those who are bowed down. He does this by revealing Jesus to them. The Holy Spirit consoles, but Christ is the consolation. If we may use the figure, the Holy Spirit is the Physician, but Jesus is the medicine. He heals the wound, but it is by applying the holy ointment of Christ’s name and grace. He does not take of His own things, but of the things of Christ. So if we give to the Holy Spirit the Greek name of Paraclete, as we sometimes do, then our heart confers on our blessed Lord Jesus the title of Paraclesis. If one is the Comforter, the other is the Comfort. Now, with such rich provision for his need, why should the Christian be sad and despondent? 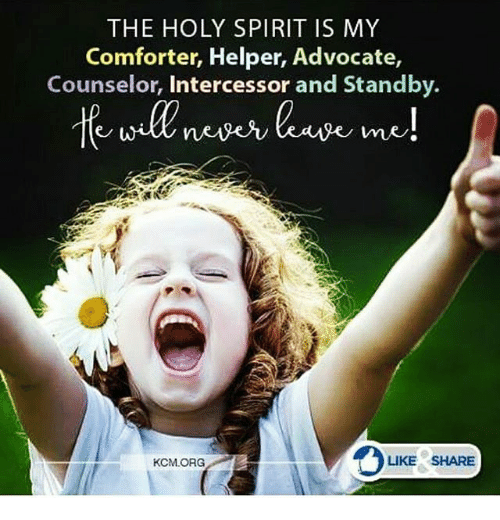 The Holy Spirit has graciously committed to be your Comforter: Do you imagine, weak and trembling believer, that He will neglect this sacred trust? Do you suppose that He has undertaken what He cannot or will not perform? If it is His special work to strengthen you and to comfort you, do you suppose He has forgotten His business or that He will fail in fulfilling His loving task of sustaining you? Don’t think so poorly of the tender and blessed Spirit whose name is the Comforter. He delights to give the oil of joy for mourning and the garment of praise for the spirit of heaviness. Trust in Him, and He will surely comfort you until the house of mourning is closed forever, and the marriage feast has begun.